I have been pretty vocal about how much I enjoy barnhunt and how excited I am that the Solstice Cardigans have such a good time at the hunts. Because I have been very vocal about the fun we are having and I am now competing in the upper levels of Barnhunt I often get questions from other Cardi folks about how the sport works and how and what they need to compete. Our Cardis are very well suited for this sport, historically an all-purpose farm dog I’m sure it was part of the traditional job a Cardigan might have been expected to perform on a Welsh farm. Being athletic, independent thinkers Barnhunting is nothing but fun for many Cardigans. 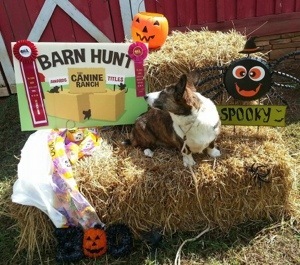 So what is Barnhunting? 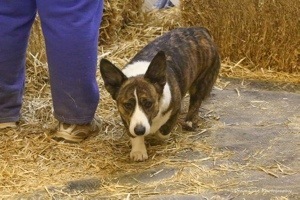 It is a timed event to test your dog’s vermin searching (hunting) and marking (finding) ability in a barn-like setting. It is not necessarily in a barn but courses are built of straw bales. Depending on your level there are different elements involved but there is an expectation of a climb (4 paws on a bale of straw) and tunnel that can be a one bale underpass or a knarly twisted raised tunnel. There will be live rats in protective tubes and empty distraction tubes. Courses are built in enclosed areas and the dogs run “naked” without collars or harnesses. What about those rats? Anyone who knows me well knows about my mouse antics (involving screaming and furniture climbing) so I’m not a big rodent fan. I’m better now that I’m a barnhunter. Even not being a fan I have a great respect for the care and treatment of the rats and if you go to www.barnhunt.com and read the rules you will see a great deal in place for their care and safety of the rats. So those are some of the basic about Barnhunt but what you really want to know is can you and your Cardigan play, sure you can. This is a sport that includes an athlete and either a coach or a cheerleader (I bet you can guess who is the athlete). The athlete job is to locate and indicate the tube with a live rat and the handler’s job to mostly stay out of the way and to trust the dog to do its job and find the rat and let the judge know when they have found it. The first thing you need to do is visit www.barnhunt.com and get your dog registered with Barnhunt and get their barnhunt number. Most Cardigans are going to be in the Small dog class, as most of our dogs are under 13 inches tall. Once you get your number you can enter a trial. You don’t have to take a class; a lot of what the dog does in novice is instinct. The hard part is recognizing your dog’s indicator of the live rat. My Bailey’s indicator is her ears, when the ears go up it means she has found the live rat. Every dog is different so you have to know. If you enter a trial, enter both the Instinct test and the Novice class. Use the instinct as a warm up. Even if you pass the instinct the first time you can still enter it until you earn your Novice title. Instinct needs one pass, Novice, Open and Senior need 3 passes and Master needs 5 passing legs (it gets harder as you move up the levels). Remember naked, you come and leave on a collar, make sure it is on when you enter and leave. The blind, be on time, late to the blind can cause you to be moved to the end of the class or miss your run all together. Don’t touch your dog other than loosely to hold for rat removal if needed (no scruffing) but you can praise and point and cheerlead and coach. 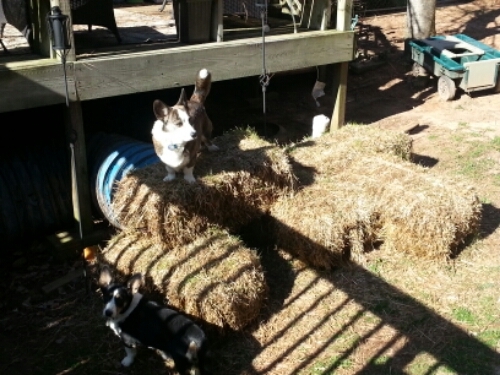 Find some bales to jump on so your dog isn’t surprised by the feel of them. I found out I can fit 5 bales of straw in my Honda Fit. If your dog has never seen a tunnel finds a way to make something that works as one. If you think your dog is on the rat, call RAT with confidence, don’t ask, tell! Volunteer to help and if you can’t help then watch the upper level dogs and handlers. And most important, TRUST YOUR DOG! So now you know a bit about Barnhunt. Currently there are 44 Cardigans with RATI (Instinct), 26 Cardigans with RATN (Novice titles) and 3 Cardigans with RATO (Open title) and I know my Bailey is a Q away from a RATS (Senior title). No Masters yet but I bet there will be as more Cardi folk start to play. So come and join us, the barnhunt.com website is very useful and if you have questions I’ll be happy to point you in the right direction.